Season 3 of The Good Place has started and in the primer episode there is a Man who Laughs Reference. Well not so much a reference as it’s right there in the frame. Moral philosopher, Chidi, is going through another existential panic. He takes to the University library and takes out a myriad of books one being “The Man who Laughs” by Victor Hugo. 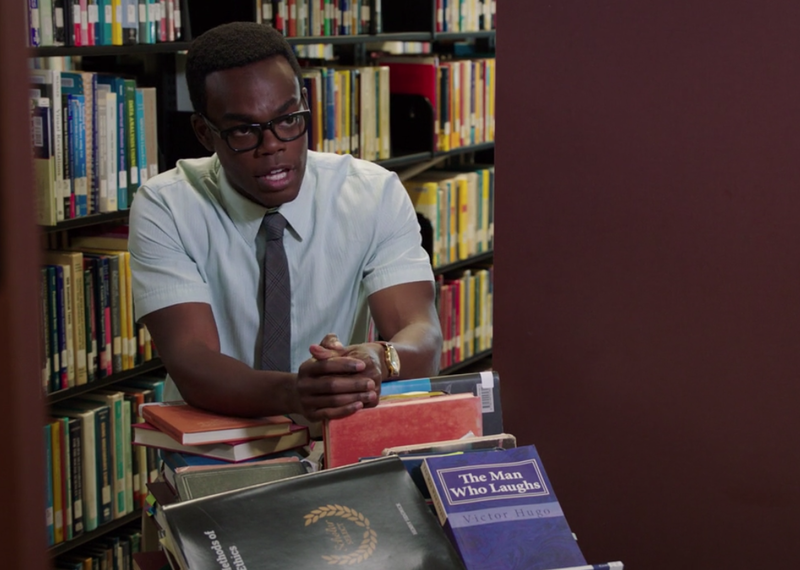 Though the main joke of this scene is Chidi holds up a book by The Chocolate Rain guy called Chocolate Book, The Man who Laughs sits front and center. You can’t miss it. I’m not sure what this means. Could be superficial advice for the character? The production people just like the book? Foreshadowing? Or it good have a deeper meaning? Not sure.